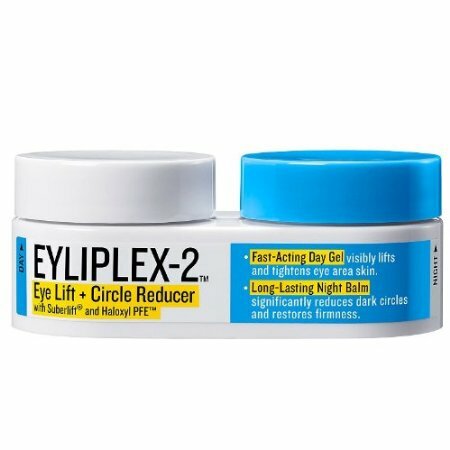 Two products packed as twins, the Eyliplex-2 Eye Lift + the Circle Reducer developed by the company GoodSkin Labs. I started personal use of products of GoodSkin Labs when I founded out that most of their products are fragrance free. As I discussed earlier; the area around your eyes is very thin and can get irritated quite fast, so it’s better to buy a fragrance free product to threat this particular area. So I bought 2 GoodSkin Eye Lifters (which by the way are retinol products) at Kohl’s, Huntington Beach in California. I bought one for my own use and one was a gift for a my colleague. The price was $ 44.50 for 0.68 fl. oz. or 20 ml. The first thing that catches your eyes is the packaging. It’s ugly and it reminds me of the special 2 component superglue my boyfriend uses to repair stuff in the house. But I really couldn’t care less about packaging if this stuff works like the superglue. As in “repairing” my dark spots under the eyes and lifting. The product is packed separately in one box. One is the “Fast-Acting day Gel” which is grayish and the other named “Long-Lesting Night Balm” which is creamy white. On the Internet you can read a lot of (fake) reviews about GoodSkin and how amazing their products are. Maybe because it’s one of many products of the big Estée Lauder company, which are known to reward a reviewer or a blogger with free products and financial compensation (offcourse they aren’t the only one!). As you already know, we are 100% independent and we HATE fake reviews. It’s time for an honest review. GoodSkin claims; “ immediately 64% of subject reported younger looking eyes”. After we tried it, we wanted to make sure it wasn’t only us so we decided to let all our friends try it till the package is empty. And we can honestly say: “immediately 0% of subject reported younger looking eyes” It didn’t do anything to make our eyes look younger. An other claim is: “in 4 weeks there is a 20% reduction in the appearance of dark circles” Only one person tried it for over 4 weeks but we didn’t notice any visible difference. I personally didn’t tried it long enough to see any results, because my believe in the product was gone. Isn’t there anything good about this product? This Eye Moisturizer of GoodSkin does a couple of things good. First of all; the ingredients are not bad and the hydration under the eye isn’t bad at all. Both jars didn’t irritated on our skin. Not even one person reported irritations. It’s not perfumed. So it isn’t total rubbish like, for instance, LifeCell. Let this be a lesson for any brand that sells anti-aging product. We don’t care how “big” you are. Sooner or later some woman like me will write an honest review about your product and your false claims are for the world to read. Just be honest on what it actually does for your skin. Hi Akram, You have to contact GoodSkin Labs. Maybe its because the boycot?